Regardless of whether you call it a rind, a zest, or the skin, the peel of an orange is usually not considered when eating. It’s often seen as a protective covering putting up a futile attempt at keeping you away from the tasty fruit flesh beneath it. If you’re interested in an extra boost to your health; however, it would be to your benefit to hold on to your orange peels. These tough, bitter skins are actually a handy way of improving your nutrition and they provide a wide number of dietary, preventative, and skin-clearing functions. Fiber, of course, helps with your bowel movements. Dietary fiber, like the kind found in orange peels, works as a bulking agent. When eating, this bulk makes you feel full faster. This is not only useful for dieting, digesting the extra bulk helps speed things along your digestive tract and out the other end. Vitamin C bolsters the immune system, helps prevent cardiovascular disease, supports prenatal health, improves eye health, reduces stroke risk, and can help manage wrinkles. The recommended daily intake of vitamin C is 75-90 milligrams. Toxicity isn’t a risk until you start getting in the region of 2,000 milligrams per day, so there is plenty of room for improving your intake with some orange peel. As the name suggests, phytonutrients (also called phytochemicals) are nutrients that plants make use of. These substances mainly serve to protect against threats like fungi or bugs. Phytonutrients are not needed by the human body in the same way that other nutrients are, but this doesn’t mean that they can’t be useful. Certain phytonutrients, like carotenoids, work as antioxidants in your body and can eliminate free radical particles. Others, like alpha and beta carotene, help promote eye health and are converted into vitamins. Flavonoids are a subtype of phytonutrients and offer many of the same benefits. An orange peel has roughly 60 flavonoids and 170 different phytonutrients, ensuring a well-rounded dose of healthful goodness. Weight loss and constipation: As mentioned, the fiber content in an orange peel makes you feel fuller after eating so you can easily consume less without getting hungry. Bowel movements can also be a surprising contributor to weight loss, especially if constipation is a recurrent issue. The fiber will assist with this as well. Allergies: Histamine is a substance that plays a part in the body’s immune reactions, particularly where inflammations are concerned. Antihistamines are a common allergy medication since they help mitigate the inflammatory symptoms that allergies can provoke. Some of the phytonutrients in orange peels work as histamine reducers and can help ease congestion in the lungs as a result. Cancer: The antioxidants in orange peels will help purge your body of free radicals—highly volatile compounds that will trigger genetic damage in your cells. The specific kinds of antioxidants that orange peels contain are most effective at reducing your risk of skin, breast, and colon cancer. Be careful not to eat orange peels if you actually have cancer though—antioxidants have recently been shown to interfere with a protein that reduces metastasis risk. Skin health: Vitamin C is quite handy for keeping your skin healthy, but orange peels have skin care uses beyond nutritional value. A cream made by mixing orange peel extract and milk can be rubbed on the skin to create a lightening effect that can hide blemishes or discoloration. The same cream, or even using the peel directly, can also ease sunburns and reduce tans. Cardiovascular health: One of the ways arterial plaques form is when cholesterol is oxidized by free radicals. Another method that your cardiovascular system can be impaired is when inflammation makes blood vessels swell and reduces available openings. One of the flavonoids found in orange peels—nobiletin—addresses both of these by being an antioxidant that helps ease inflammation. All of these health benefits from orange peels are fine, but they don’t address what may be the main obstacle: the fact that orange peels are not very appetizing. They are tough, bitter, and don’t have the best texture. Fortunately, you don’t need to eat your peels in their normal form. One of the more versatile options is to grate an orange peel. This creates a zest that can easily be mixed in with other dishes. You can sprinkle it on salad, mix it in with vegetables, or even use it as an ingredient in smoothies and desserts. Alternatively, orange peel extract can be purchased which you can use to make creams for your skin. The extract can also be used in teas for soothing lung relief and decongestion. There is also the option of just eating the peel straight. It may be a bit tough and not have the greatest taste, but it does provide you with all of the benefits directly without any fuss. Make sure you get organically grown oranges when possible, especially if you plan to eat the skin directly. The hardy nature of an orange’s rind means that it can retain pesticide compounds more easily than the flesh, which you may wind up consuming. Otherwise, enjoy! The Fruit peel That You Should Never Throw Away!! Chilukoti, B., “Top 7 health benefits of orange peel,” TheHealthSite web site, September 1, 2014; http://www.thehealthsite.com/diseases-conditions/top-7-health-benefits-of-orange-peel/. Metcalf, E., “What Are Phytonutrients?” WebMD web site, http://www.webmd.com/diet/guide/phytonutrients-faq?page=1, last accessed October 19, 2015. 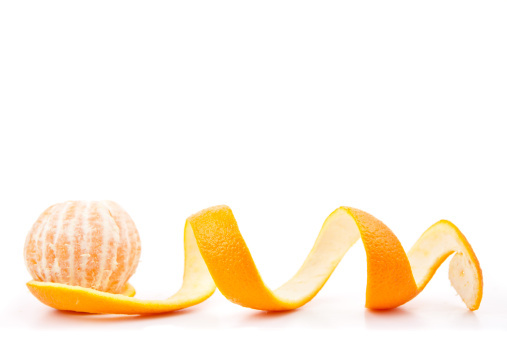 “Nutrition Facts and Analysis for Orange Peel, Raw,” Self Nutrition Data web site, http://nutritiondata.self.com/facts/fruits-and-fruit-juices/1976/2, last accessed October 19, 2015. Zelman, K., “Vitamin C Benefits, Sources, Supplements, & More,” WebMD web site, http://www.webmd.com/diet/the-benefits-of-vitamin-c, last accessed October 19, 2015.